I’ve always loved music, and for a long time had a traditional stereo system with cassette and CD components attached. As I began ripping my CDs into iTunes and buying downloads from Apple and Amazon, the computer replaced the stereo as my hub for at-home listening. Which is a shame as the quality of a computer’s speakers is anything but top-notch. And even when I connected the Mac to a 2.1-channel system, it did nothing to solve the problem of the Mac being tethered to my desk. Interesting as they seemed, I avoided devices such as the SliMP3 and then the early Squeezebox models, even as now-Editorial Director Jason Snell talked them up. And I did so because I wasn’t interested in going back to the stereo-in-the-living-room model (even with a device connected to it that brought the non-DRM portion of my music collection and Internet radio along for the ride). 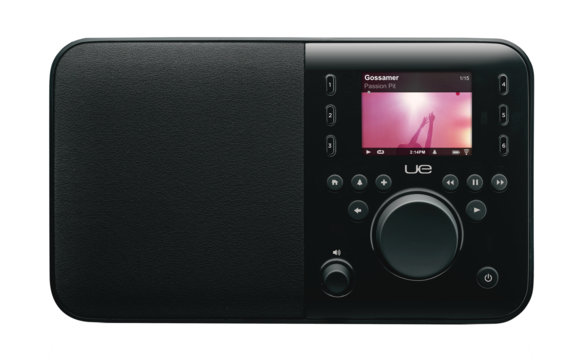 The Logitech UE Smart Radio. It really wasn’t until Squeezebox arrived in all-in-one configurations (by then owned by Logitech) that I seriously considered—and ultimately started using—a standalone streaming audio player. For the last several years, I’ve been enjoying Logitech’s $180 UE Smart Radio and, before that, the company’s Squeezebox Radio. I’ve found them to be good enough for what I wanted from a hardware standpoint, but I have to admit that their software and UI never thrilled me—and in fact often left me frustrated. All this time, my colleague (and favorite grumpy old man) Chris Breen wouldn’t shut up about the virtues of Sonos and its multi-room streaming audio systems. 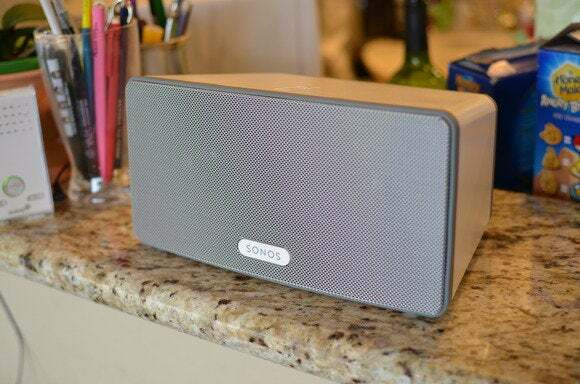 Early on, two factors kept me from giving Sonos a try: I wasn’t looking for a multi-room solution and my budget couldn’t accommodate the $1000 necessary to get a reasonable starter system. 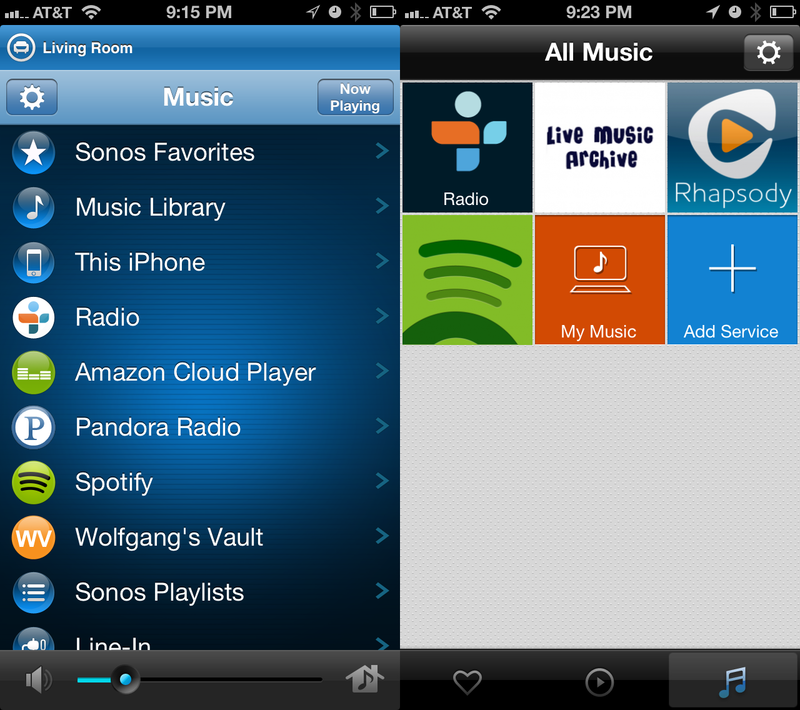 The Sonos Play:3 with iPhone. That all changed with the introduction of the Sonos S:5 (later renamed the Play:5), the first player to offer integrated speakers, at a cost of $399 (plus an optional Bridge if you didn’t jack it in via ethernet). And then came the Play:3 at $299, making Sonos even more affordable. After an initial hiccup, setup was a breeze. I plugged in the Play:3, downloaded the free Sonos Controller app on my iMac, ran through the simple setup, and pressed the Bridge’s single button and then added the Play:3 through the software. Done. And when it was done I couldn’t have been happier with the controller app (both desktop and mobile). In regard to functionality and ease-of-use Sonos’ iOS app is light-years ahead of the Logitech app—it offers what Logitech’s kludgy OS X system preference pane and website do together (and much more). The Sonos (left) and UE Smart Radio (right) iOS apps. It’s also more reliable. Accessing my Spotify account on the UE Smart Radio was hit or miss. Tracks would seem to play—with time elapsing on the iPhone app—but nothing came out of the speaker. I haven’t had a single hiccup like this with Sonos. Like Logitech, Sonos supports a lot of services—Spotify, Mog, Rdio, Pandora, iheartradio, Slacker, Rhapsody, Last.fm, Hearts of Space, Stitcher SmartRadio, and Songza among them. Thanks to Sonos I can stream my entire 35,000-plus track music collection that’s stored in Amazon Cloud Player Premium as well. And as a fan of live music I’m happy to have access to the treasure-trove of concerts that come with my Concert Vault subscription. At the same time, however, switching away from the UE Smart Radio means I lose the ability to stream shows from the Live Music Archive. Like Logitech’s offerings, Sonos lets me play content from my iTunes library, but Sonos also lets me stream directly from an iOS device without the need for an AirPlay or Bluetooth speaker. And the sound quality on the Play:3 (which isn’t even as beefy as the Play:5) puts the Smart Radio to shame. 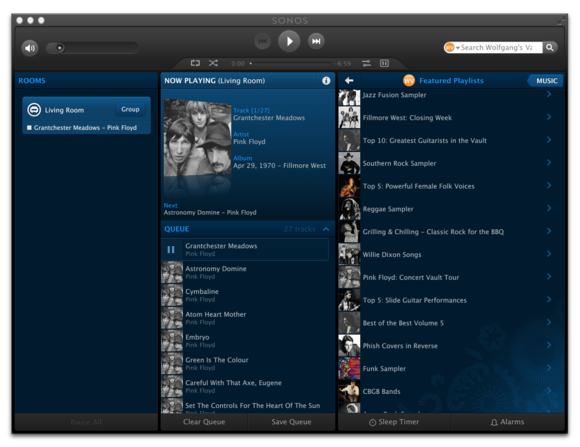 The Sonos desktop controller (click to enlarge). Also, now that I live in a house with more than one floor, the idea of being able to add additional Sonos components (when I find some extra money, that is) to play the same or different things around the house is intriguing. I’m going to guess that this will be even more important when my kids are older and want to listen to their music—and I really don’t. There are some things I’ll miss about the UE Smart Radio. I liked having an LCD screen that displays track info, album art, and the time; and on-device controls let me choose content without resorting to a remote control—the Play:3 has only mute and volume buttons, and no type of display. But given the fact that I always have an iPhone or iPad handy (and can use a Sonos Controller application on my Mac if need be)—and that the Sonos app is so easy to use—it’s been less of a problem than I had anticipated. Another loss is that the rechargeable battery in the UE Smart Radio meant I could move it to another room when the kids were playing downstairs and wanted to listen to some music. Sonos can’t help me with that—other than sell me another Play:3, of course. My Smart Radio has a new home on my nightstand where I use it as a clock and secondary music player. But for my everyday music needs, it’s now Sonos. If, like me, you’ve hesitated over its price or because you weren’t sure how Sonos would fit into your musical life, it’s time to give it a try. It’s already changed the way I listen to music.